Waterproof shower mats help prevent extra moisture from seeping into the shower surface and causing mold and mildew build-up. Having a shower mat in a shower or tub can not only make your bathroom safer, but can also make it more attractive and keep the shower in better shape. Waterproof mats for showers help prevent extra moisture from seeping into the shower surface and causing mold and mildew build-up. A shower with a mat requires less upkeep. The mat protects the floor and can easily be removed for cleaning, which is much easier than scrubbing out a shower. Waterproof mats come in different styles and designs. Besides keeping the shower safe, they can add a stylish touch to the bathroom. Any shower mats that have a grip on the bottom to keep the mat in place keep a shower safe. This is especially important for a family with children, disabled, or elderly members. Showers are slippery and a mat will help prevent dangerous falls. Round Waterproof Shower Mats – This is a circular waterproof mat made of allergen free vinyl. 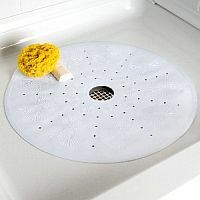 At 23 inches in diameter, it can provide a wide slip free surface over your shower drains. Shower Safety Grip Treads – If you want to have more choice in where there is traction, consider grippers for shower floors. These are shower treads that have grip and can be applied anywhere you may need extra footing. Use the sticky adhesive to apply these long strips of grip, anywhere you stand or walk on, in the bathroom. Shower mats should have a textured surface on top and non-slip grips on the bottom. These mats will get wet, but their outer surface is designed to get wet and remain non-slippery. The grips on the bottom keep the mat in place, even on a wet floor of a shower stall. 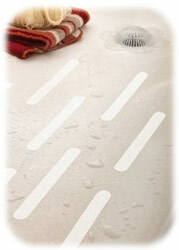 A waterproof shower mat gives an extra advantage not allowing water to seep in and destroy it. The mat protects the floor, but the mat itself needs to have waterproof protection or it can become full of mildew. This poses other health problems and becomes as dangerous as a slippery floor. The American with Disabilities Act requires that showers have a stable, non-slip floor. This can easily be done by buying bathroom water proof floor mats. Adding a waterproof shower mat to an ADA compliant shower adds an extra safety precaution. Just make sure the shower mats do not hamper the movements of a wheelchair. There are many reasons to add a waterproof mat to your shower. Keep your family safe and install one today.